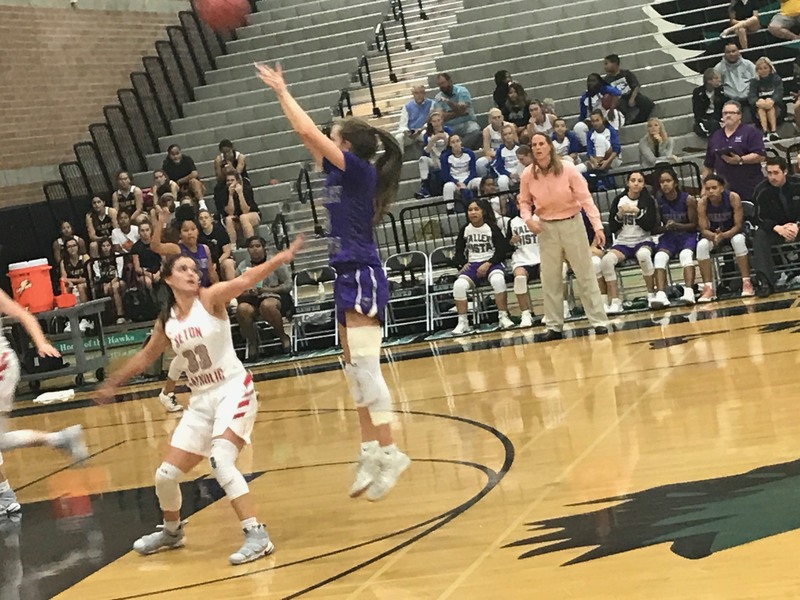 Three defending girls hoops state champions and one semifinalist from 2016 comprised the semifinalists Friday night at the annual Lady Hawk Thanksgiving Invite hosted by Highland and Mesquite high schools. Fans got their money's worth as Seton and Valley Vista see-sawed much of their game before the Sentinels won out in the final seconds, 58-55. Right after that Mesquite pulled away in the final 3:30 to best Gilbert, 59-48. Both games were played at Highland High. Seton (4-0) and Mesquite (4-0) tangle Saturday night at 6:30 in the championship game at Highland. It's a rematch of last year's tourney final, won by Seton. That was the last loss Mesquite suffered and the only one it sustained in the 2016-2017 campaign. Seton guard/post McKenna Klecker, a reserve last year, sank two free throws with 58 seconds left to break a 55-55 tie. Klecker isn't known for her scoring but totaled 12 in this one. New York transfer guard Sara Pfeiiffer made one of two free throws with 17.9 seconds left for the final margin. 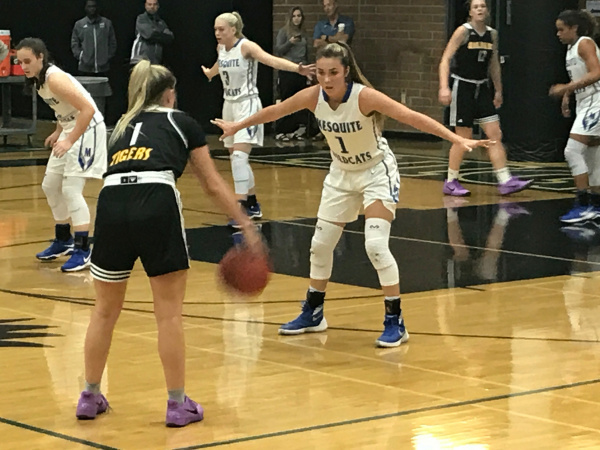 Valley Vista's four-year, standout guard Taylor Chavez, missed a tough three in the final seconds and the Monsoon couldn't get off another shot before time expired. With 1:35 to play Chavez drained a three that forged the final tie at 55. Chavez signed a letter of intent earlier this month with Oregon. Chavez was limited to seven points in the first half. She ignited Valley Vista in the third quarter on defense, as a playmaker and scorer. Chavez scored eight of her 18 points in the third period that saw the Monsoon erase a 31-27 halftime deficit to lead by seven heading to the fourth period. Senior teammate Clarissa Rodarte added 15 points for Valley Vista (3-1). Leading the way for Seton was senior guard Sarah Barcello. Barcello's 21-point effort, her best of the young season, was huge. Barcello, who has rehabbed a troublesome foot injury, all off-season, played her first game in nearly seven months in the tournament's first game on Monday and was understandably rusty. She sat out pool play wins over Desert Ridge (Tuesday) and Horizon earlier on Friday. Also helping was the aforementioned Pfeiffer, who has been an offensive force in the first four games. Pfeiffer checked in with 18 points and has demonstrated a solid offensive game, particularly from the perimeter. Pfeiffer is averaging about 20 points a game. Mesquite's win, its 30th in a row, was fueled by reigning Gatorade Player of the Year and Brigham Young signee Shaylee Gonzales. Gonzales the high-energy, senior guard, poured in 28 points - 14 in each half. She tallied 10 of those points in the final period as the Wildcats pulled away from a two-score lead and made 9 of 13 free throws down the stretch. They slowed the game's up-tempo flow. in the final minutes protecting a six-poiint lead. Mesquite ended up outscoring Gilbert 15-8 in the final period. Senior guard Lindsey VanAllen, the other half of the dynamic four-year duo with Gonzales for Mesquite, made her presence felt mostly in the third period when she connected for eight of her 10 points. That included a pair of threes that pushed a two-point lead to 10 at one point in the third quarter. Gilbert (3-1) per normal was led by twin junior guards Haley and Hanna Cavinder. Haley hit for a team-high 26 points and Hanna added 12.